It’s not quite warm enough for shorts yet, but there’s sunshine aplenty and a good turnout for Looe Marine Conservation Group’s first summer rockpooling session of the year. As always, the Cornish rock pools don’t disappoint. 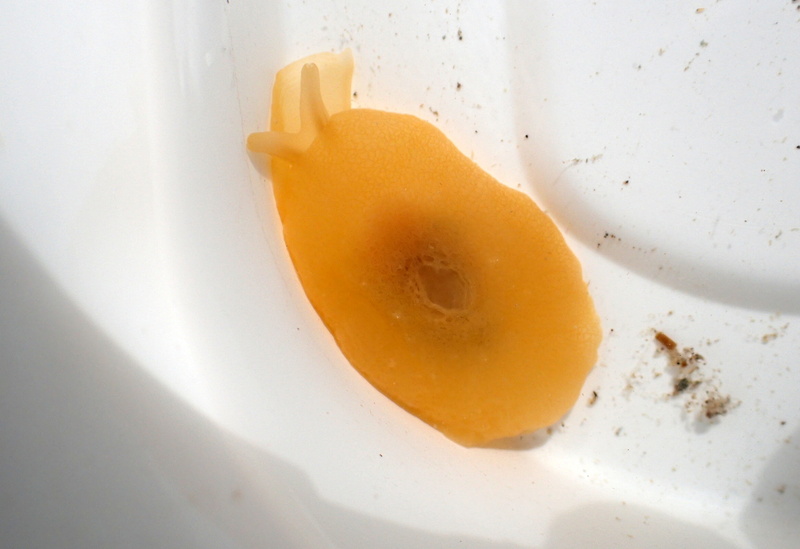 My first find of the morning – a ‘plumed Bertha’ Berthella plumula – a sea slug with a small internal shell. The big creatures are always the star attractions of public events. 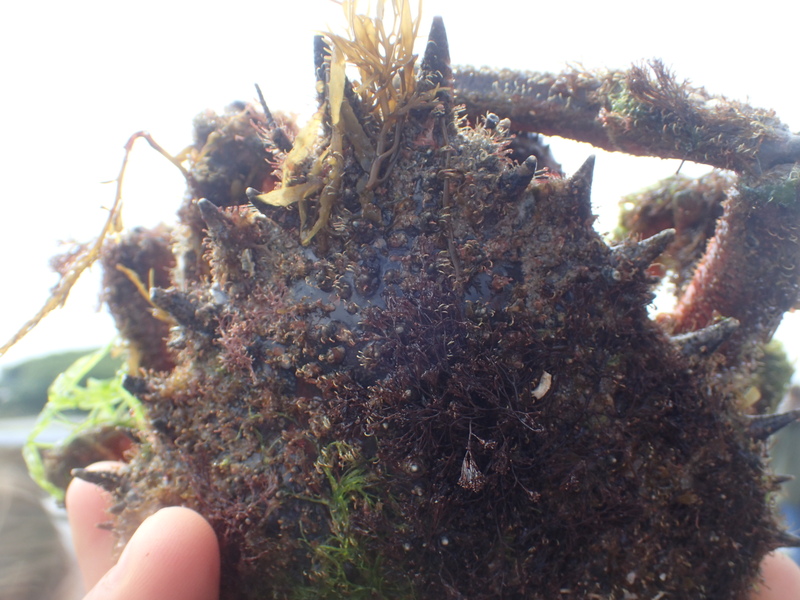 Today we are lucky enough to find several magnificent spider crabs. Spider crabs come into the Cornish rock pools in early summer. 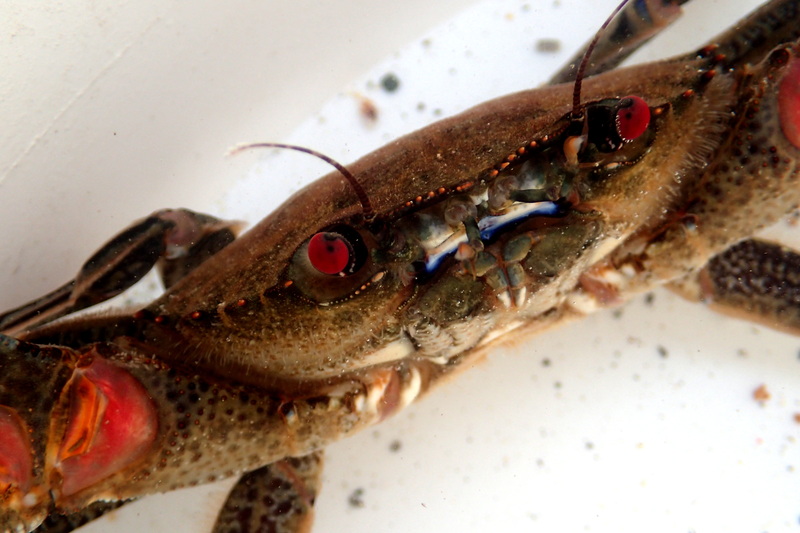 These large crabs with their characteristic spiky shells live out at sea for most of the year, but venture into shallower water in the early summer to breed. They get their names from their long, spindly looking legs – although, being crabs, they have ten legs, not eight like the spiders. 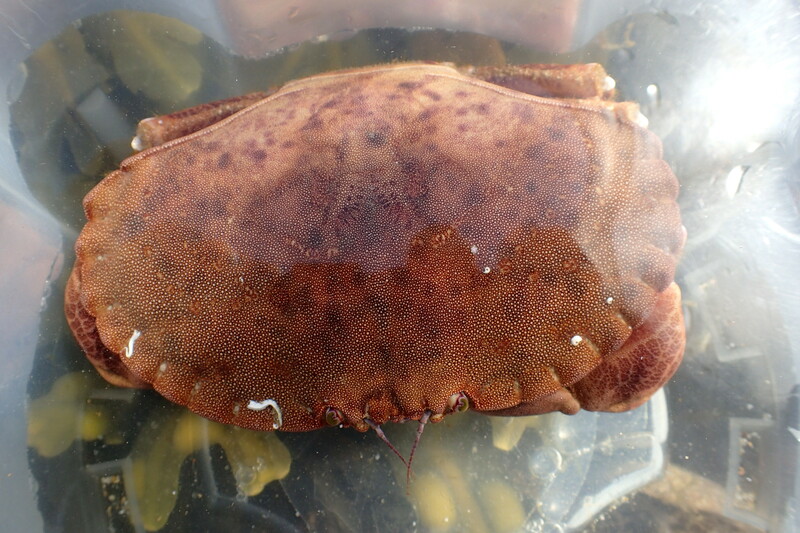 Some sizeable edible crabs lurk at the bottom of buckets, but it is the velvet swimming crab that causes the most gasps. These red-eyed crabs, which my son calls devil crabs, are feisty to say the least and as today’s rockpool leader, Matt, goes to pick one up, it raises its claws in defiance. Velvet swimming crabs are quick to attack. Matt takes several attempts, but eventually manages to lift it from the bucket and hold it in front of the upturned faces of a circle of children. He points out the paddle-shaped legs that help it to swim and the smooth velvet surface of the shell before swiftly returning it and moving on to more placid creatures. 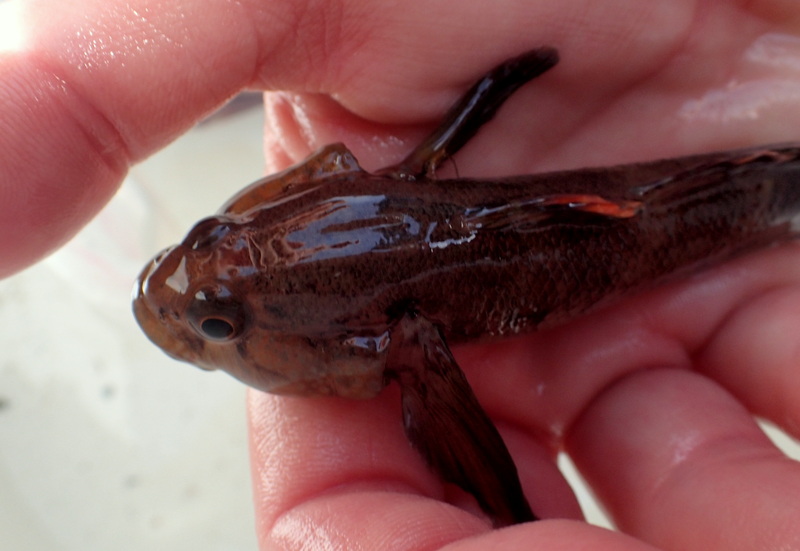 This rock goby was easier to handle – the yellow top to its fin can clearly be seen here. Our local vicar has become a staunch regular on these jaunts and, as always, he’s brimming with smiles and enthusiasm. He makes one of the best finds of the day, although only a few of us make it to the tide’s edge over slippery rocks to see the stalked jellyfish. Lucernariopsis cruxmelitensis – a stalked jellyfish. This little jelly is in an awkward position to photograph and the tide is rushing in, but we manage to get some pictures. Lucernariopsis cruxmelitensis – it’s a mouthful to say, but I think it’s the most beautiful of our stalked jellies with its wide open profile and delicate decoration of white nematocysts around each arm. Lucernariopsis cruxmelitensis – the hand in this shot shows just how small these stalked jellies are. 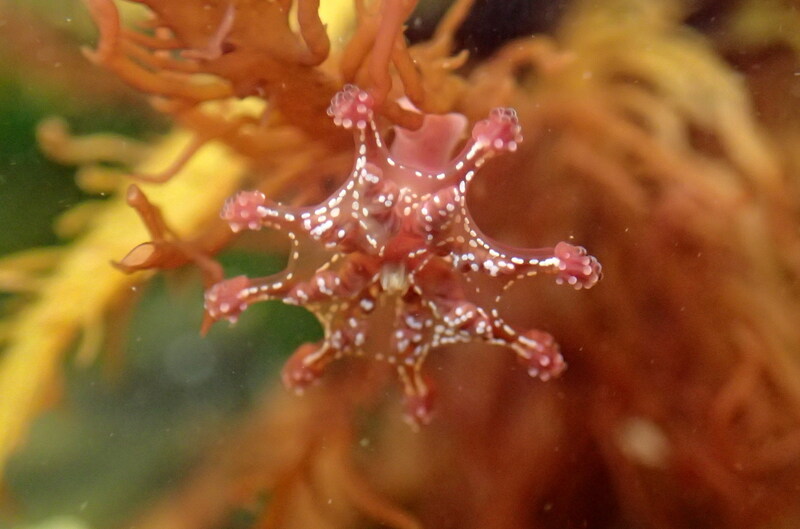 One of my favourite Cornish rock pool creatures. 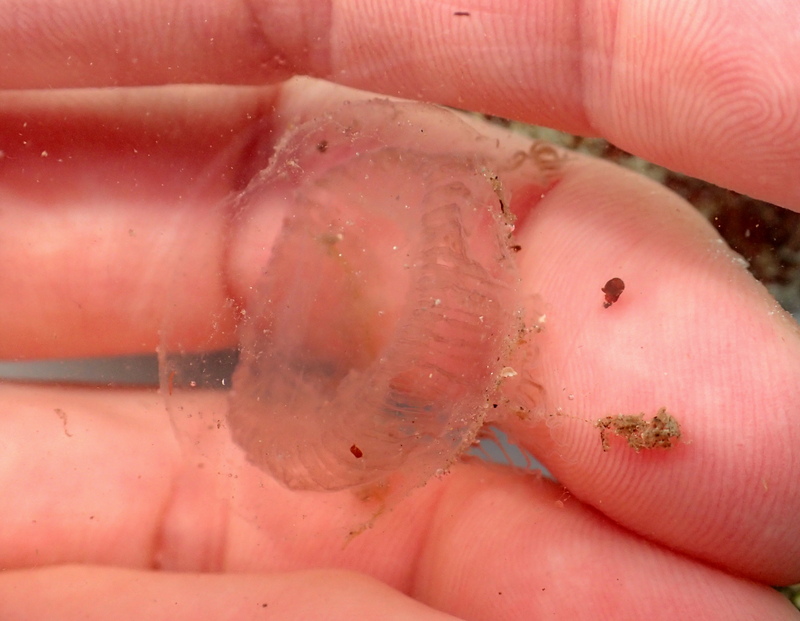 The next jellyfish we find is a little larger, but still only a few centimetres across. It’s so transparent, I can’t tell most of it is there until I feel the curve of it against my fingers. 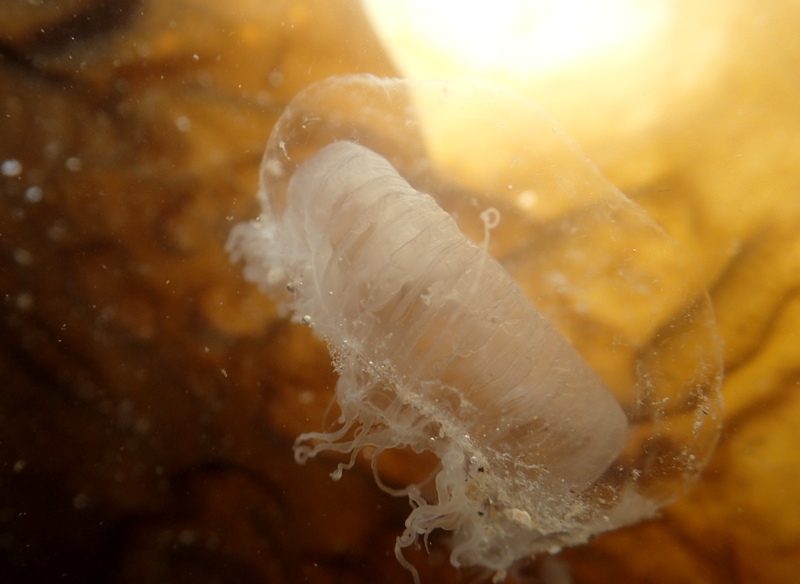 This week’s mystery jelly – probably an aequorea species – crystal jellyfish. From the shape and the faint radiating lines around the base of the bell, I think it may be an aequorea species, also known as the crystal jellyfish. We’ve found these before in Looe, but they’re not a common species – or maybe they are but they’re so transparent they’re hard to spot. It’s wonderful to spend a whole morning on the shore without my fingers becoming painfully cold or having to rush home to counteract early signs of hypothermia with hot baths and drinks. I might even risk going out without a coat soon. 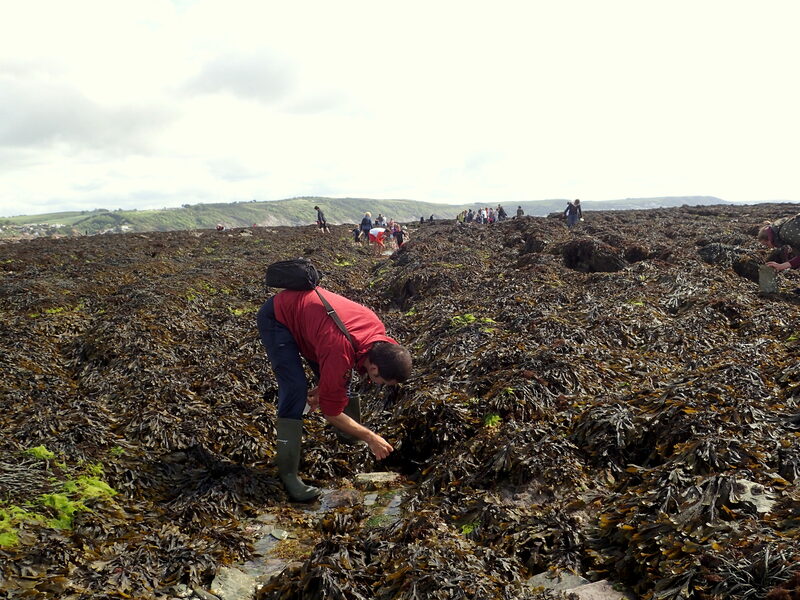 Looe’s vicar doing some quality rockpooling. Summer is definitely on its way and if you’re heading for the shore, group events like this one are the best way to discover the fantastic Cornish rock pools. See my links page for lovely groups who run events all through the year. 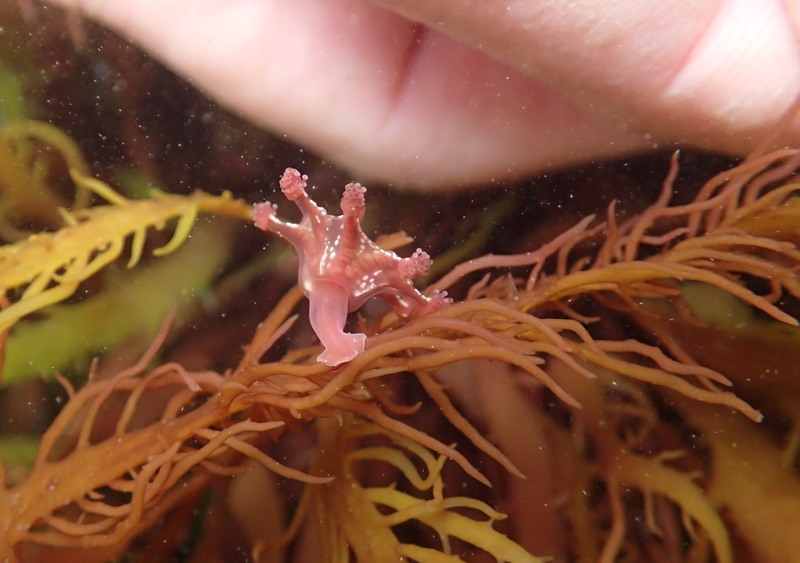 Follow Cornish Rock Pools on Facebook for updates. Thanks for the link. Found one we might attend while on holiday. Its on the 5th of July at Prisk Cove. There are good spring tides that week so you should have a brilliant session – Ruth at Cornwall Wildlife Trust is leading that one I think and is very knowledgeable. I don’t think I’m free that day otherwise I’d love to go too. Have a fantastic holiday and don’t forget to let me know what you find! Love your blog Sean – the weather looked amazing and you found a brilliant range of species. I love the candy stripe flatworm, they’re fascinating little creatures. Let me know if you’re down this way again. I was away as well, otherwise would definitely have joined you at Prisk Cove.